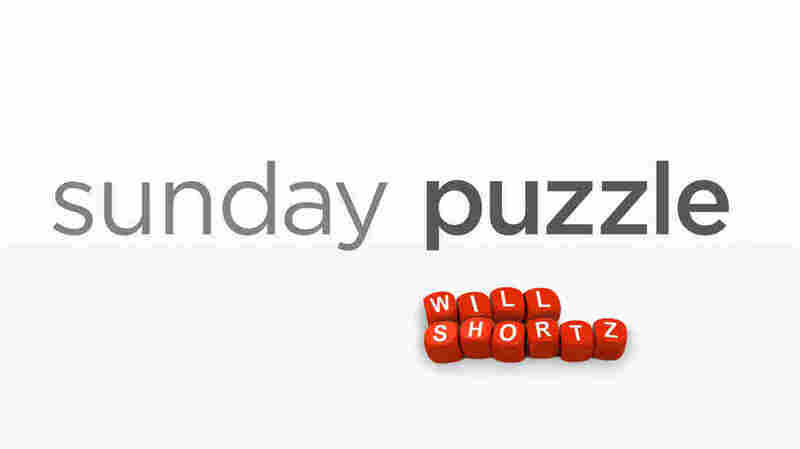 Sunday Puzzle: Slogan Scramble NPR's Lulu Garcia-Navarro and puzzlemaster Will Shortz play this week's puzzle with KSTX listener, Erin Rodriguez of San Antonio, Texas. On-air challenge: I'm going to read you some famous advertising slogans, past and present. Each contains the advertiser's name, but anagrammed. You name the advertiser. 7. Pardon me — Do you have any YOUNGER POP? Last week's challenge: This week's challenge comes from listener Steve Baggish of Arlington, Mass. Take the name of a classic song that became the signature song of the artist who performed it. It has two words; five letters in the first, three letters in the second. The letters can be rearranged to spell two new words. One is a feeling. The other is an expression of that feeling. What song is it? Winner: Erin Rodriguez of San Antonio, Texas. This week's challenge: This week's challenge comes from listener Joe Krozel of Creve Coeur, Mo. Name a vehicle in two words, each with the same number of letters. Subtract a letter from each word, and the remaining letters in order will spell the first and last names of a famous writer. Who is it? If you know the answer to next week's challenge, submit it here. Listeners who submit correct answers win a chance to play the on-air puzzle. Important: Include a phone number where we can reach you by Thursday, Jan. 31 at 3 p.m. ET.